We decided to extend our normal one week per lesson into three. Apples are a fun topic especially this time of year. We began by picking apples while visiting an apple orchard. 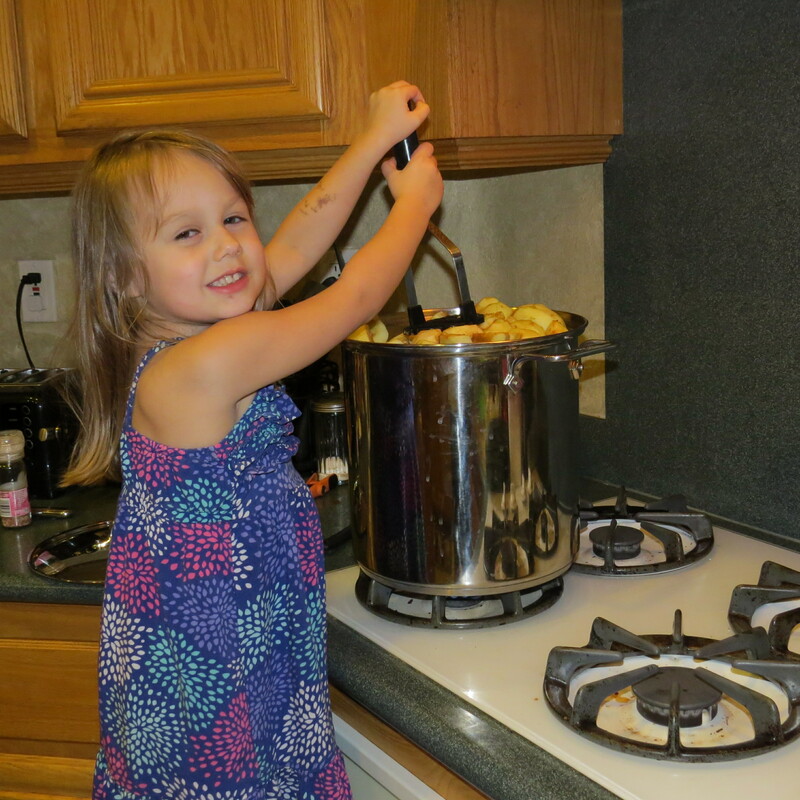 Next, with daddy’s help, we made applesauce. Naturally. After some poking around on Pintrest, I discovered these two ladies, Megan at coffeecupsandcrayons and Katie at giftofcuriosity, who had the same idea. 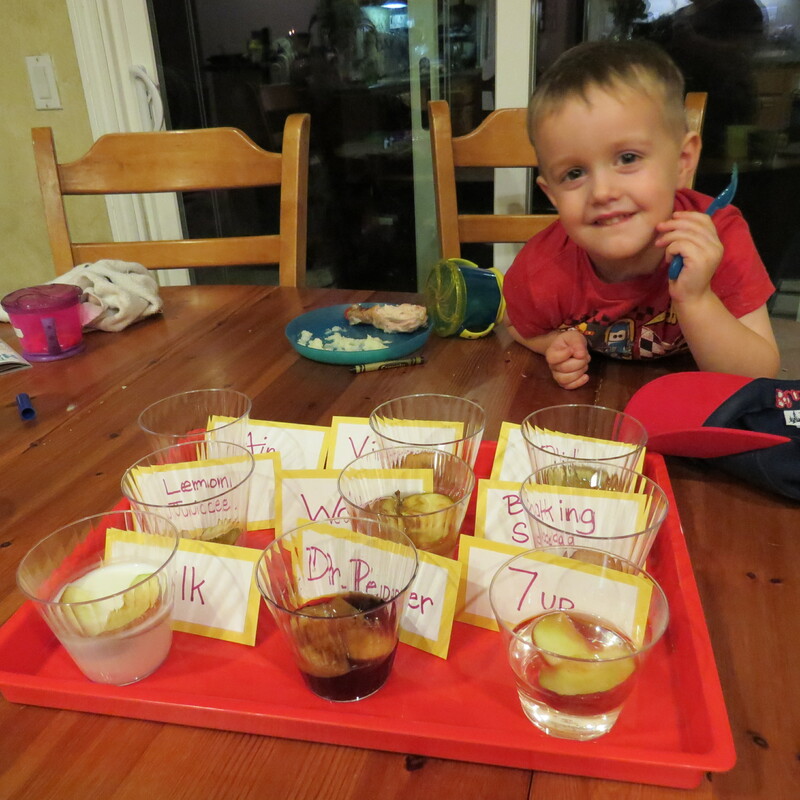 I am really excited to do hands on science with my preschooler and kindergartener so I was thrilled to discover this. We did our own version. First we got clear plastic cups to put our apples in. 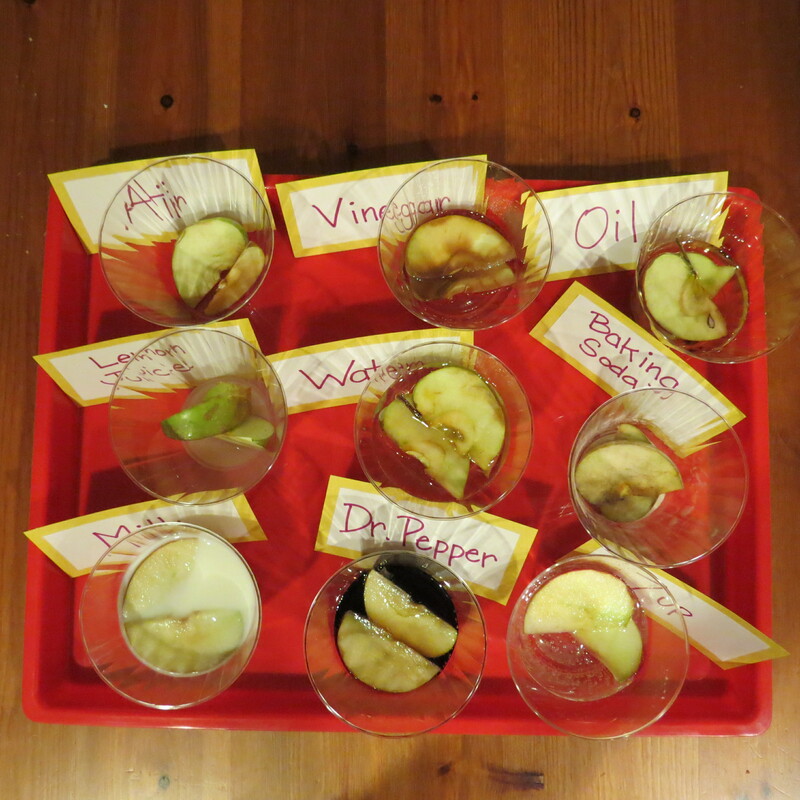 Then I cut up 1 1/2 apples and the kids put in 2 slices into each cup. They each had a turn in putting in each ingredient for each container. Here is the list of items we rotted the apples in. This guy liked checking out our experiment every night. And here it is on night 4. I had only intended it to go on for 3 nights. Oh well. Its hard to see but the apples definitely looked quite different from the last night to the first night. 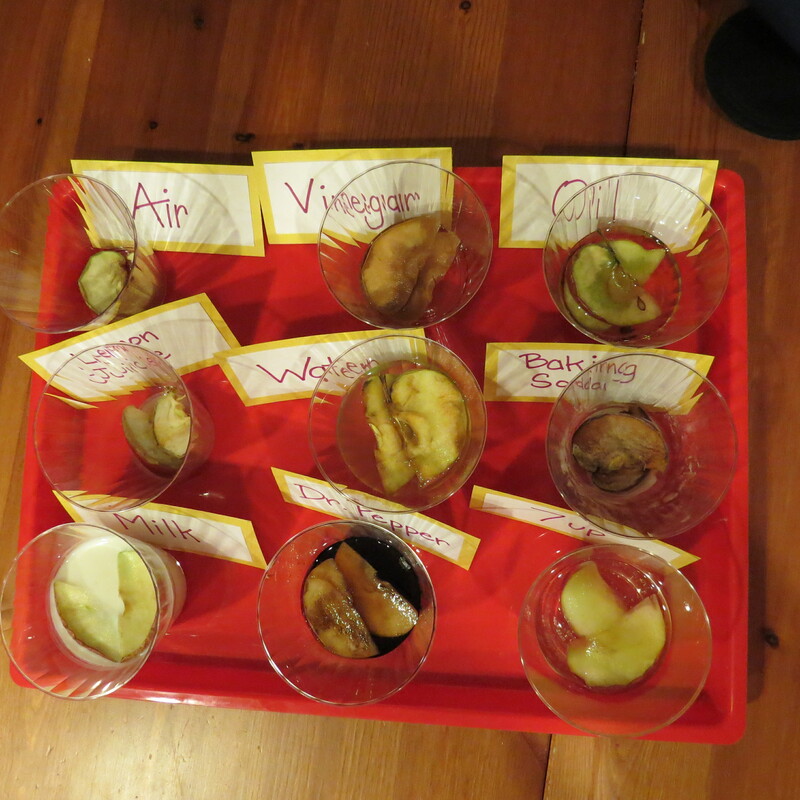 Because I had the privilege of checking out the other ladies experiments, I knew what to expect with some of them, like the air causing the apple to shrivel up. But I wasn’t sure about everything…. Grossest color change? Triple tie between Vinegar, Baking soda, and Dr. Pepper. One I wouldn’t eat on a bet? Milk. It didn’t do anything to the apples (not really), but it congealed and that alone made me gag. The one I would eat from night 4? 7 UP. HANDS DOWN. It still looked delicious even! I couldn’t believe it. The one I would do differently? Lemon juice. I only sprinkled it on instead of submerged it and it wound up looking nearly identical to Air. I should have put a different citrus juice, like orange juice, and drowned the apple like the others. The kids loved watching the different reactions. It would have been fun to do this if my kids were older too so they could really examine and write down their thoughts on rotting. Which ones would you change?